Given the power to build a perfect Wide Receiver, few would make Drew Hill. WRs are meant to be towering, spidery men, all arms and legs, with an eagle’s wingspan and the ability to fly over defenders. Drew Hill stood 5’9” on his tiptoes. He barely cleared 170 soaking wet. Yet for 15 years, Drew dominated the gridiron. What Drew Hill lacked in physicality, he redoubled with work ethic and and ability. Andrew “Drew” Hill was born October 5th, 1956 in the affluent town of Newnan, Georgia1. Founded in 1828, Newnan earned a reputation as home to Georgia’s rich and powerful. That pedigree and wealth survived into the 1980s. Hill grew up poor, one of 11 siblings. His parents, almost children themselves3, left the rearing to Drew’s grandmother, Ruth Dix4. At Newnan high, Drew excelled at football, basketball and track. Though he wanted to focus on basketball, Drew chose football at the urging of his father5. It proved a fruitful decision. Hill slashed defenses as Newnan’s running back. His sprinter’s speed and keen ability to move the football earned Drew collegiate attention. Just up Interstate-85, Georgia Tech’s young coach, Pepper Rodgers, needed world-class rushers to execute his triple-option offense. Rodgers offered Hill a scholarship. Hill accepted. Drew Hill struggled at Georgia Tech. Though he quickly gained a reputation as a quiet, confident workhorse, Tech’s roster overflowed with talented rushers. Drew Hill faced a choice: change positions or warm the bench. Never one to back from a challenge, Drew Hill remade himself as a wide receiver. Tech’s triple-option offense had little need for receivers, though. In Drew’s freshman season, Georgia Tech threw a total–a total–of 46 passes. The Yellow Jackets infamously defeated Notre Dame in 1976 without throwing once6. For most of his time at Tech, Drew served as an option decoy and kick returner. Coach Rodgers finally opened the playbook in Drew Hill’s final season. The Jackets threw more passes in 1978 than they had in the previous five years combined. Drew ran with the opportunity. By season’s end, Drew Hill stood among Georgia Tech’s all time leaders in receptions, reception yards, yards per catch, kick return yards, and kick return touchdowns. Drew still holds Georgia Tech records for return yards, return touchdowns, yards per return, and longest return. And even though Tech’s football history boasts a wealth of names like Calvin Johnson and Demaryius Thomas, Hill still sits third in yards per reception and 8th in total career yardage7. The NFL didn’t know what to make of Hill. He showed electric ability, but few owners wanted to gamble on a 5’9” receiver. Scouts crudely labeled Hill as just “another midget who could run fast.” The Los Angeles Rams, though, needed a kick returner. Given latitude to use the Rams’ final 1979 Draft Pick Draft however he pleased, team VP Harold Guiver used the 328th overall pick (out of 330), on Georgia Tech WR/KR Drew Hill. Hill wowed Rams coaches from the start. Despite being an undersized 12th round pick, he made the team’s roster as a kick returner. After an injury-plagued 1982 season, Hill set a Rams franchise record with 1,170 return yards in 1983. Even better, he began to see time at WR. Struggling against poverty, struggling for playing time in college and the pros, it looked like Drew Hill was about to overcome and truly make his mark in the NFL. A series of disastrous choices put all Drew’s work at risk. 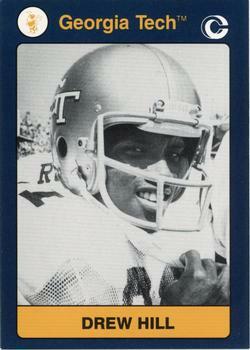 In 1983, the Rams drafted sprinter Ron Brown 41st overall. Even though Brown sat out the 1983-84 season to complete in the 1984 Los Angeles Olympics, his arrival signaled the beginning of the for Hill in LA. After Brown’s 4×100 relay squad won gold in world record time, he joined the Rams. Hill and Brown shared kick return duties in 1984, but after the season ended, the Rams, not needing two undersized speedsters, traded Drew Hill to the Oilers for 4th and 7th round draft picks11. On the surface, the trade looked disastrous. With a recent Super Bowl appearance, two straight playoff seasons and Rookie RB Eric Dickerson, LA looked poised to win a championship. The Oilers, on the other hand were the league’s lovable losers. Journalists laughed that Houston bungled the 1983 Draft, trading away the pick which LA eventually used on Eric Dickerson. The situation in Houston wasn’t as glum as some said. When Canadian Football All-Star QB Warren Moon decided to jump to the NFL, the Oilers won a bidding war for his services. Better for Hill, Oilers coaches didn’t see Drew Hill as a kick returner. They saw Hill’s nose for the football, his ability to catch anything in a three-yard radius. The Oilers removed the “/KR” from Hill’s “WR/KR” duties and installed Drew as Warren Moon’s #1 target. It was like the opening of Georgia Tech’s offense all over again. Between 1979-1984, Drew caught 60 passes total for the Rams. In 1985, with Warren Moon slinging passes, Drew caught 65. Hill finished the season with 1169 receiving yards, 5th best in the NFL. The talent had been there all along. News coverage of the Rams’ 1979 training camp praised Drew’s speed, his strength, and his fearless ability to catch balls over the middle of the field, where most WRs fear to tread12. It took Houston’s staff to finally accept that 6’5” of WR talent can live in a 5’9” body. In 7 years in Houston, Hill racked up nearly 7,500 yards receiving. Only a strike in 1987 and a broken vertebrae in 1989 (which only sidelined for two weeks13) kept Drew from eclipsing 1,000 yards receiving each year in Houston. His astounding performance earned Drew trips to the 1988 and 1990 Pro Bowl. Hill had an even better year in 1991–catching 90 passes for 1,100 yards–but the league picked Buffalo verteran James Lofton in his stead. Hill joked, “I figure [The Pro Bowl] didn’t want to take two 35-year-old guys.”14. Pro Bowl or no, 1991’s Tecmo Super Bowl shows the 35-year-old Hill outgunning kids ten years his junior. His 63 Max Speed puts Hill second, behind only Jerry Rice15. Hill’s insane 75 Receptions score recognizes Hill’s enduring ability to catch anything within his reach. Taken together, Drew Hill’s TSB stat line make him a no-brainer choice as the game’s 2nd best-WR, behind only Jerry Rice (who was 8-plus years younger). Drew Hill: This Guy Catches. A crowded AFC kept Houston from the promised land. No matter how well Drew’s Oilers played, another squad edged them in December or January. Teams like Cleveland, Denver and Buffalo crushed the Oilers’ Super Bowl dreams year after year. Hill played the final two seasons of his career with his hometown Atlanta Falcons. Even without Warren Moon, Hill put up respectable numbers. He caught 60 passes as Atlanta’s slot receiver in 1992. During the 1993 season, Hill’s grandmother, who had raised young Drew, passed away. Drew also wanted to branch out into the business world. So in January of 1994, after 15 seasons in the NFL, Drew Hill called it a day. He finished with 634 total receptions, then 9th-best in NFL history16. Had the Rams not wasted 5 years of Drew Hill’s career returning kicks, he’d undoubtedly have a bust in Canton. Will the Real Drew Hill Please Stand Up? In September of 2009, a reporter for the Santa Monica Daily Press wrote about a phenomenal artist working on the Santa Monica pier. The artist, down on his luck and near-homeless, produced amazing, kinetic portraits of Jimi Hendrix, Julius Erving and Kobe Bryant. Hill claimed years of alcohol, drug and steroid abuse had taken their toll on his body. Numerous health issues and lingering injuries from his NFL days kept him in constant pain. Only painting brought Drew Hill any measure of relief. The story, a former-NFL All Pro, ground down to nothing by his time behind the Shield, only to find redemption in art, sounds too good to be true. While “Drew Hill” the homeless artist painted in Santa Monica, Drew Hill the former Oiler was building a business in Atlanta. The artist’s real name is Broderick “Drew” Hill. “Drew” claimed excessive partying ruined his NFL Career. He claimed to have clashed time and again with NFL ownership. He claimed he’d dated a number of celebrities. He claimed his art dated back to his playing days, that only a select handful of teammates knew about his true passion. Perhaps most damning, the fake “Drew Hill” claimed he’d abused steroids in the NFL. It made for entertaining news copy, but was entirely false. After Drew Hill quit football, he found another love: golf. It meshed his business interests and competitive nature. Deals often occur on the 18th green. On March 17th, 2011, Drew Hill went out for a round of golf in Atlanta. Something wasn’t right, though. He described feeling ill. Drew checked into nearby Piedmont Hospital, where he suffered two massive strokes. In the wake of The Santa Monica Daily Press’ faulty reporting, a number of obituaries for Hill erroneously attributed his illness to drug use. This is false. There is no proof of any such drug use. To the contrary, outside of his youthful indiscretion in 1981, Drew Hill lived an upright life. After his passing, friends and teammates spoke only of Drew’s work ethic, his kindness, and his faith. Tecmo Super Bowl echoes the praise of Hill’s teammates. Even facing the game’s top defenders, Hill finds a way to come down with the football just when you need him to. Drew Hill lived a life exponentially bigger than his 5’9” frame. He battled adversity at every step, and, when given his chance, he shone. That is his legacy: a man who fought adversity and won. A Tecmo Legend, Drew Hill. There must be something in Newnan’s water. Though the town counted only 16,000 citizens in the 2000 census, Newnan is home to a slew of current and former NFL players, including GOAT WR Calvin Johnson. “Beat Notre Dame without throwing a pass? Georgia Tech did it in 1976.” Newberry, Paul. St. Louis Post – Dispatch; [St. Louis, Mo] 27 Aug 2006: D.12. “Rams’ Drew Hill Arraigned on 4 Reduced Counts.” Roberts, Rich. Los Angeles Times [Los Angeles, Calif] 12 Jan 1982: d1. “Drew Hill of Rams Placed on Probation.” Los Angeles Times [Los Angeles, Calif] 07 May 1982: f4. “PRO FOOTBALL ’87 An Unexpected Catch Wide Receiver Drew Hill Is Best Gift Oilers Could Have Received From Rams.” Wojciechowski, Gene. Los Angeles Times [Los Angeles, Calif] 12 Sep 1987: 15. “Oilers top Pro Bowl selections.” McClain, John. Houston Chronicle [Houston, TX] 19 Dec 1991: 1. 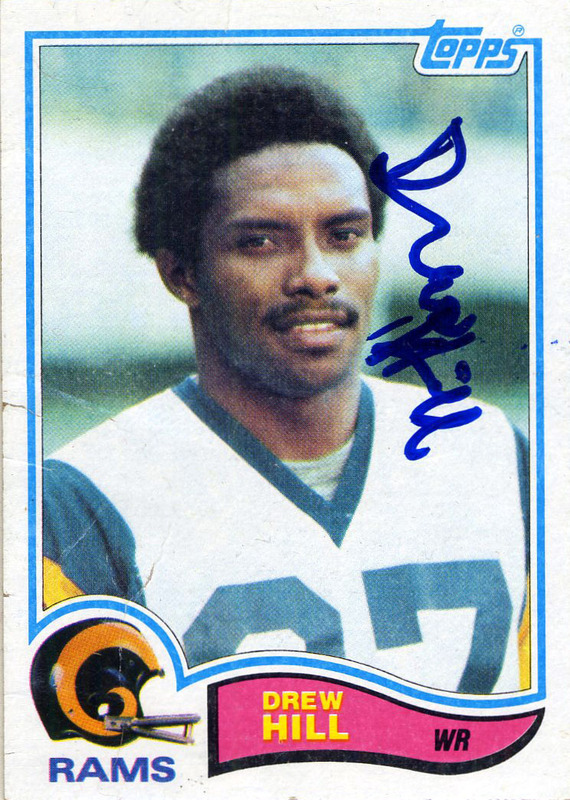 Ironically, Ron Brown, who the Rams chose over Hill because of his speed, did not make the Rams TSB roster. “So they say . . .” Austin American Statesman [Austin, TX] 06 Jan 1994: C2. “Ex-NFL Star Turns Artist.” Neworth, Jack. The Santa Monica Daily Press [Santa Monica, CA] 25 Sep 2009. http://smdp.com/ex-nfl-star-turns-artist/75042; retrieved 9/11/2017. “An Artist Imitates Life.” Neworth, Jack. The Santa Monica Daily Press [Santa Monica, CA]. 01 Oct 2010. http://smdp.com/an-artist-imitates-life/77295; retrieved 9/11/2017. This entry was posted in Tecmo Super Bowl and tagged Drew Hill, Georgia Tech, Houston Oilers, Los Angeles Rams, Tecmo Legend, tecmo super bowl, Warren Moon.